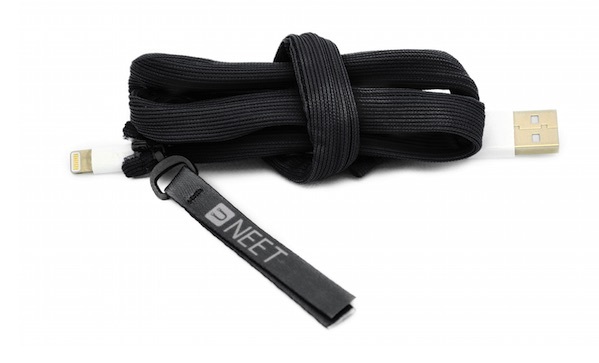 The NEET cable keeper ($12) is one of those ideas that seems so simple as to be obvious in retrospect. Seriously, why didn’t I think of this? Basically, it’s a fabric sleeve that stores cables. You can unzip it, load up a bunch of cables (my record is six), zip it back up, and boom—you have a cable bundle. It’s pretty handy for all your desktop cables or back of the TV and xbox cables—you know, stuff that doesn’t get transported anywhere a whole lot. Another neat feature: it has a bendable wire running down it’s spin, so you can form it to latch onto something, wind it up with the expectation it’ll stay bound, or wrap it around your wrist if you’re going somewhere. With cables, I assume. Overall, the cable keeper is simple, easy to use, and it’s pretty great to have a few kicking around. After all, life’s a little better when the cables are a little better organised.